Back when electricity was first being introduced in a little Scottish village almost everybody in a particular church switched from propane lanterns to electricity just as soon as it could be hooked up. However, the oldest couple in the congregation couldn’t get their electricity because they were waiting for the poles to go up and the wires to be strung. They continued using the propane lanterns. The day finally arrived for them to bring electricity to their home. Everyone came for the festive event. The man waited for it get extra dark and then told his wife to go turn on the switch. When she did, the light filled the room and everyone rejoiced. The man grinned from ear to ear, picked up the propane lamp and said, “It sure makes lighting my lamps easier.” And with that he lit a lamp and his wife turned off the electricity. Are there things in your life that you may still be hanging on to from the past when you could be living in the present? I love funny stories like this one to help us see a spiritual issue, that we might not otherwise notice. I mean, it does seem silly, to wait for electricity, get it hooked up, throw a party and then not use it. Doesn’t it? Sometimes we can be like this older couple, wanting and waiting for the new thing to happen, and yet afraid to embrace the change of it all. Other times, we can be so focused looking and waiting for the new thing, that we completely miss when it’s right in front of us. 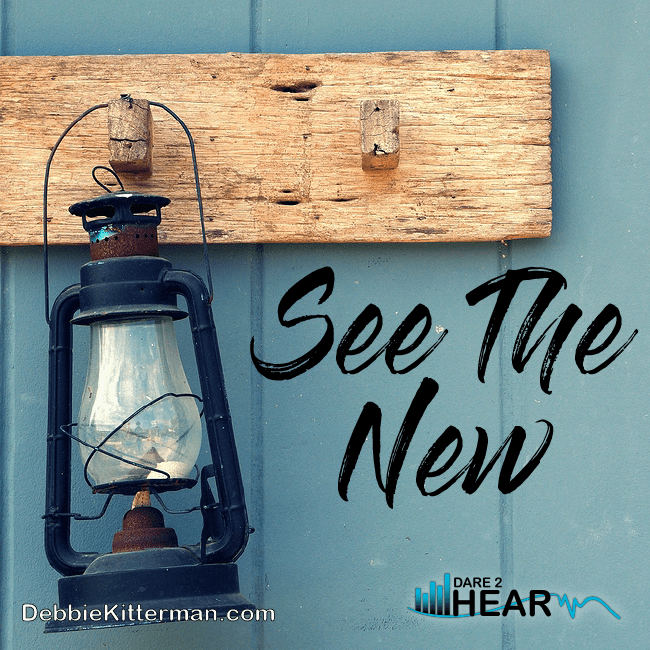 When we are afraid to embrace the change, we tend to hang on to our old ways, and old patterns, and we don’t see the new thing right in front of us. We need to expect it, see it, embrace it, and let go of the past, so we can accept the new things God says He is doing! 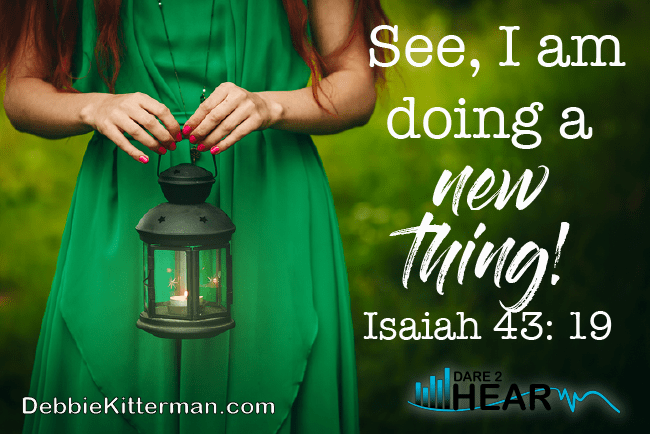 What New thing is God doing in your life today? What #NewThing is #God doing in your life today? Have you Heard? Elite Blog Academy is about to open their doors for registration. It only happens once per year. The doors open for EBA 3.0 on Monday, March 5th and close Friday, March 9th. Chuckling over your story about the lamps– and wincing a tiny bit too. I can be such a stick in the mud at times. Oh my, what a story! I love having electricity. Have a great day! Thanks Kelly. I enjoy electricity too and can’t imagine life without it. Dear Debbie, while our first house was being built, my family had to stay at Mama and Daddy’s. Our 4 year old daughter had a rough day after a couple of weeks, then awoke with unconsolable nightmares. When Daddy came to check on her, I told him Mary didn’t do well with change. His response seemed harsh at the time, “Change is always a part of life;it tells you that you’re living.” Over the past 30+ years, what felt harsh at the time has become a reassurance amidst the seas of change. Thank you the reminder and affirmation. I could easily be like this older couple! What a great story to share and remind us not to live for the past, but to look to the news things God is doing in our lives and embrace them!! Oh Lisa, so sorry to hear you had the flu – it has been a doozy this year, I got walloped with it in January. Take it easy, because it tends to come back with a vengeance if you don’t. Praying it is all done and gone from your house, never to return. Love that story! Thanks for all the work you put into hosting your party, Debbie. Hope you have a relaxing weekend ahead. Love you Deb…your linkup has GROWN and I’m always late. Thursday seems to be my chill-out day. Very nice, thanks for this. Thanks for hosting and I hope you have a wonderful week. Thanks Patrick! You have a great weekend and wonderful week as well. Your story was funny but packed a punch! We do cling to our old ways don’t we? !